Your phone rings, the number on the screen starts with your local area code. Of course you're going to pick up. What if it's the school nurse calling about your children? What if it's your dentist's office calling to reschedule an appointment? Then you pick up and a recording tells you that you've won a free cruise to Alaska or that you owe money to the IRS. Yes, you've been hit by a robocall. These obnoxious recorded messages are used by companies to persuade you to buy something you usually don't need. Not only are they annoying, but robocalls can be dangerous, too. Plenty of scammers use them to trick people into giving up their Social Security numbers, credit card digits, or other personal information. Worst of all? These robocalls are increasing, and so are complaints from consumers who have been harassed by those prerecorded pitches and scams. Fortunately, there are steps you can take to stop at least a chunk of these calls and to protect yourself from any automated scams targeting your phone number. The Federal Trade Commission reported that in 2017, consumers filed more than 4.5 million complaints with the commission about robocalls. That ranks as the highest number of complaints in any year, and is a sharp increase from the more than 3.4 million robocall complaints consumers filed with the FTC in 2016. Your first step is to sign up for the National Do Not Call Registry, offered by the FTC. Telemarketers are prohibited from using automated dialers to call cellphones or landlines on the list, unless the owners of these numbers give them consent first. Unfortunately, listing your number on this list doesn't stop all robocalls. That's because many of the companies or scammers behind these calls won't hesitate to ignore Federal Communications Commission regulations. Once you've listed your number on the Do Not Call Registry, it's time to download call-blocking apps that can help you prevent repeat robocalls from the same number. The Mr. Number app is a popular one, and allows you to block any number that has sent you a robocall and calls from known scammers. You can also block calls from numbers not in your contact list. There are competitors out there, including apps such as Truecaller and Should I Answer. 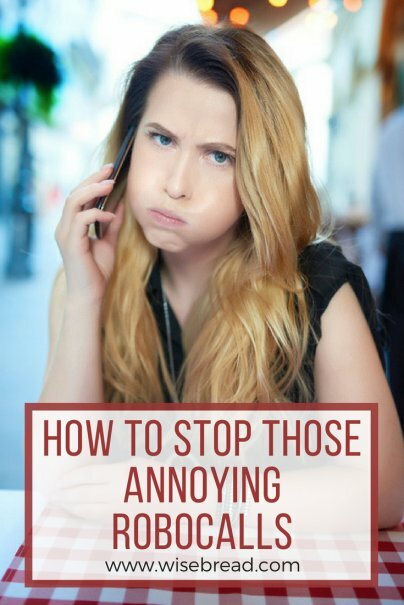 These will help you greatly reduce robocalls. Wireless providers understand that robocalls are a nuisance, too. So it's not surprising that some of these providers offer their own call-blocking apps. AT&T offers the AT&T Call Protect app that lets you block calls from suspicious numbers and past robocallers. T-Mobile provides its own Scam Block tool that allows cell users to block all known scam calls before they ring up their phones. And Verizon offers its own suite of call-blocking services, including call block, caller ID, and anonymous call rejection. What if, despite the measures you've taken to prevent them, you still receive a robocall? First, if your call is coming from a number you don't recognize, don't answer. If the call truly is important, whoever is calling will leave you a voicemail. If you do answer, hang up as soon as you realize you're dealing with a robocall. Some robocalls will request that you hit the number "1" to speak with a live operator. Never do this. You'll just be connected with someone trying to sell you something or scam you. Others might ask that you press a certain number on your phone to stop receiving calls. Don't press that number, either. You'll usually be connected to another operator who wants to sell you or scam you.